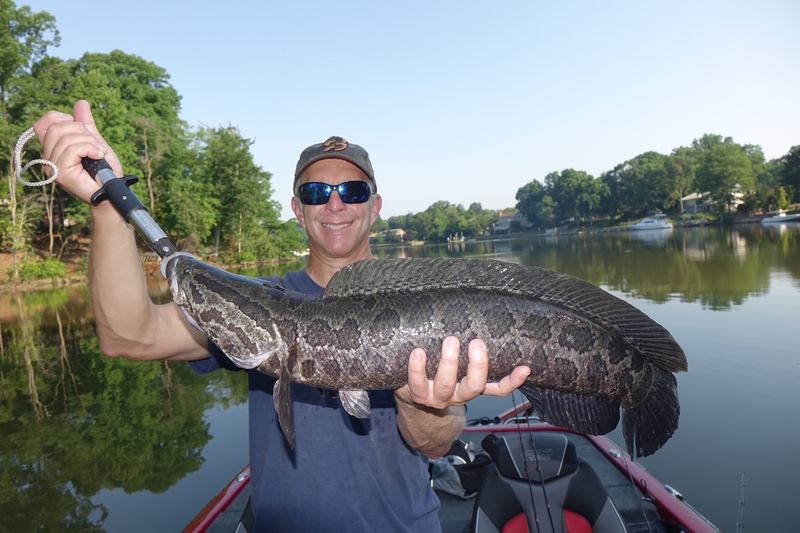 More divisive than politics, debates over whether Potomac River Northern Snakeheads should be a protected sport fish lit up social media pages after being ignited by a Washington Post Op Ed by John Mathwin. In 2004, Frankenfish frenzy covered pages and TV screens across the country. Even the Sopranos mentioned those ****** snakeheads. With little scientific documentation, legends were circulated. Walking on land, eating small children and spawning like rabbits made this toothy creature more ominous. So evil, an entire pond was chemically treated to execute all fish to find illegal fishigrants. Like a first kiss, area anglers romanticize their first snakehead. Catching my first snakehead, I didn’t know what it was. It was mean. It was ugly. It was nasty and slimy. I thought I’d hooked a lawyer. But we cut it open and saw it had a heart and knew it wasn’t a lawyer. In just a few years, snakehead populations boomed and Potomac River guides were catching hundreds a year, booking trips with wannabe Fish Monster anglers. They put up a great fight, kinda like trying to pull a dog off a fire hydrant. According to many anglers, snakeheads are pit bulls in a pool of poodles. Since they’re obligated to breath air topwater lures work well, adding to snakehead excitement. Now guides only get a couple dozen, still fielding calls from snakehead hunters as world records continue to be broken. Living in shallow waters makes them accessible to anglers. And there’s cuisine in that catch as snakeheads are one of the best tasting freshwater fish! As appetizing as that sounds, it might not be enough to convince MD DNR biologist Joe Love to relax current restrictions. It’s unlawful to possess or transport live snakeheads. MD encourages anglers to kill snakeheads, but not mandatory. When questioned about allowing the snakehead population to regenerate, Love reasoned with his peers at the first International Snakehead Symposium held in Alexandria in July. Love acknowledged the Potomac population has stabilized or likely diminished due to catch and kill efforts, including bow fishing. However he strongly stated it wouldn’t be a good idea to allow snakeheads to expand unchecked as a game fish. Efforts over the last ten years should not be ignored as this fish, listed as an invasive, could have negative consequences for the Potomac River. Not entirely onboard with the snakehead’s downside, VDGIF biologist John Odenkirk said snakeheads are unwelcome, but whether they’ll cause ecosystem damage has not been shown. The Potomac’s bass population is doing well and snakehead stomach contents do not include largemouth bass. In fact, despite some dietary overlap, competition does not seem to be occurring. Overall, there’s very little snakehead documentation, as their countries of origin don’t have much of a paper trail other than recipe books. Odenkirk isn’t in favor of declaring snakeheads a national disaster. Mathwin laments the snakehead’s decline, although kayak angler Johnathan Leavitt reports ample catches in waters accessible only by stealthy shallow drafting vessels. Blaming MD and VA authorities for wanted dead or alive snakehead management programs, Mathwin suggests it’s time to end that practice and designate the snakehead a game fish, limiting the number of snakehead that can be kept. Mathwin admits catch and kill was reasonable when snakeheads were discovered in a Crofton, Maryland pond a dozen years ago. Within a couple of years, it invaded the Potomac and burst to astronomical numbers with populations peaking and stabilizing in 2012. It was thought they spawned up to 5 times a year. The Snakehead Symposium discussed two spawns, but not altogether sure if the same fish spawned twice or if there were two spawning periods. Pointing to accepted data, there’s no effect of snakeheads on largemouth bass, Mathwin asks for a stay of execution. Reiterating Joe Love’s suggestion, where we would be now if anglers, bow anglers and meat hunters did not remove these top-level predators from the Potomac? It’s bad enough some anglers are illegally Johnny Appleseeding…carrying fish to other bodies of water. But what if left unchecked, or spared and protected? Love doesn’t want to find out. It’s noteworthy that increased bow angling has accelerated the check on the snakehead population. There’s no catch and release. Some social media warriors are always quick to point to largemouth as a non-native Potomac species. It’s the game fish of choice with several industries built around it. Is there room for another game fish in the livewell? As for now it’s too risky. Too many unknowns. The Snakehead Symposium reminds us that one man’s invasive is another’s sport fish. Japan and Hawaii are trying to revive and maintain their snakehead populations; a management task complicated by that darn predator, the largemouth bass. Lack of rain has dramatically reduced grass abundance, so any grass bed or wood cover will be a solid target. This could set up to be the best fall fishing ever. Start with topwaters early and then work down. Mann’s Baby 1-Minus on 14-pound GAMMA Edge fluorocarbon bounces off hard cover and snaps free from grass. Vary retrieves to get bites. Under cloudy skies and stained water, try Mann’s Classic spinnerbait, also on 14-pound Edge. Pitch Mizmo Tubes to grass clumps and docks. Polarized Maui Jim sunglasses help locate grass and pieces of wood. Use 3/0 Mustad Ultra Point tube hooks and 3/16-ounce bullet weights. 16-pound Edge would be a good idea. Use faster Quantum Smoke casting reels with a 7’ MH G-Force rod. Soaking in garlic Jack’s Juice Bait Spray helps!